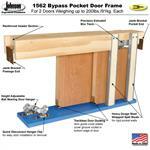 Pocket Frames (doors sold separately) stocked Assembled and Johnson Knock-Down (requires assembly). Assembled frames stocked for 2x4 construction in 6'8", 7'0" & 8'0" heights for single and double door applications. Johnson adjustable frames stocked in 2x4 and 2x6 construction for 6'8", 7'0", 8'0" ( 9'0" height available). 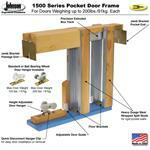 Johnson frames can be cut down for door widths of 3'0" and smaller. 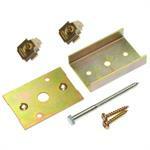 Packaged for 3'0" door width and marked for cutting for smaller widths. Available for several door heights. 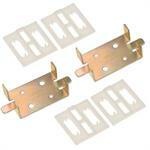 Adapter for Johnson 1500 pocket frames for 1-3/4" thick doors. 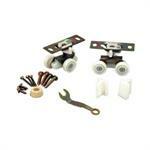 Included on 2x6 wall kits. 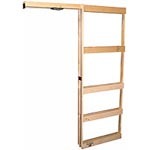 Choose this option if you want our wood pocket door frames to carry up to 250 lb. doors. View hardware only options here.